A Russian warship has seized a pirate vessel with 29 people on board off the Somali coast, Russian news reports say. Guns and navigation equipment were found during a search of the pirate boat, officials were quoted as saying. 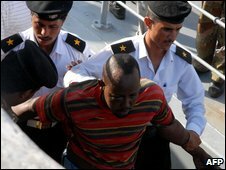 They said the suspected pirates were thought to have launched two unsuccessful attacks against a tanker with a Russian crew. Russia is one of the countries that has deployed naval ships against pirates operating in the area. Navies from Nato, the EU, Japan, China, India, Yemen, US Malaysia and Singapore have also been patrolling the Indian Ocean and Gulf of Aden. However, the number of attacks has continued to rise. Somali pirates have hijacked 25 vessels since the beginning of this year and are holding more than 260 crew around the stronghold of Eyl in northern Somalia, according to the International Maritime Bureau. Naval patrols have captured pirates on a number of occasions. Some have been put on trial in Kenya, while France has charged three suspected pirates and a Somali teenager is facing trial in the US. Earlier on Tuesday, regional leaders in Somalia's northern Puntland region told the BBC they have put together a militia of fishermen to catch pirates. Twelve armed pirates in two boats have been captured by the vigilante groups, they said. When first loaded, the map's focus falls on Somalia where most of the pirates are based. Use the arrow icons to scroll left towards Europe and the United States which are both playing a central role in tackling the problem. Scroll to the right for a story about the Philippines, which supplies many of the world's mariners. You can zoom in for more detail by using the "+" or "-" signs on the upper left hand side.